There is nothing wrong with presenting an image as close to reality as is possible. It takes a great deal of talent both in capturing the image and getting it ready to be viewed. Clyde Butcher ( http://www.clydebutcher.com ) is one of my favorite photographers of this era and while he does dodging and burning his images are as close to reality as possible. He has spent years documenting the Florida Everglades and other locations and I consider him a documentary photographic artist. On the other hand, more and more, I am seeing my world in a different way. Sometimes in what I would call abstract and other times in a way I would like to paint it, if I had the talent to wield a paint brush. 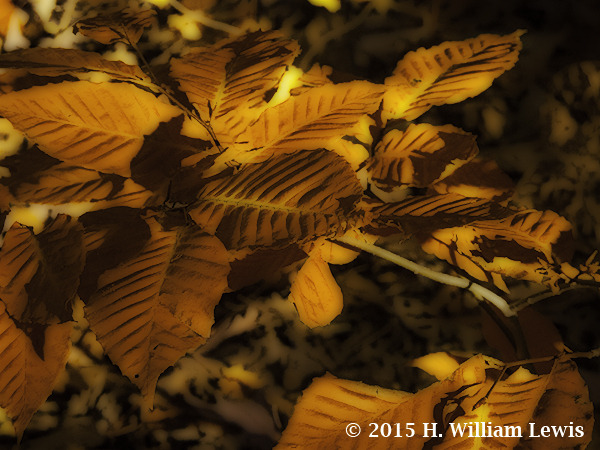 The attached image is an attempt to add a “painterly” feeling to this photo of leaves. I would be interested in knowing if you feel I have done that. Your objective comments are appreciated.